Give Kids a Smile Day is the best day of the year at the School of Dental Medicine. Two huge yellow school buses pull up to Squire Hall on the South Campus and let out their passengers, children ranging in age from about 3 to 7. The kids stream into Squire, home of the School of Dental Medicine, where they meet volunteers who greet them and assign them to student escorts. Welcome to the 12th annual Give Kids a Smile (GKAS) Day. GKAS Day, held this year on Feb. 1, provides free dental care for children who don’t have access to regular dental care. 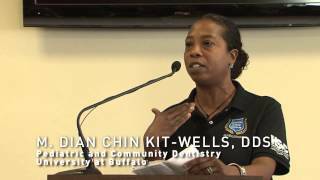 Those volunteers included faculty, staff and students from the UB dental school, as well as dental hygiene students from Erie Community College and UB’s Educational Opportunity Center and private Western New York dentists. This is the fifth year that the whole Fest family has been involved in the event. Fest’s two sons, Colin, 13, and Mitchel, 11, served as private patient escorts. “I feel really grateful to be part of it because of all the kids we’ve helped and the free dentistry. At the end of the day, it’s a really good feeling knowing that you’ve helped so many kids,” Colin said. This year’s theme is “Dental Heroes—We have the Courage to Care.” In keeping with the theme, some volunteers wore superhero capes. Most of the dental heroes—including tooth fairies and the Teddy bear mascot—gathered in Harriman Hall, site of the popular Teddy Bear Clinic. The Teddy Bear Clinic often is the last stop of the day for the kids after they receive their dental care. “We are here because our kids do not have dental insurance,” said Katie Preston, whose 5-year-old son, Zachary, had a few cavities filled; Mason, 4, and Bran, 1, had their teeth cleaned. “This event is definitely helpful because just one cavity that Zachary had with the X-ray would cost us $350,” she said. Among the patients were 60 to 70 Amish children from Pennsylvania. Tom LaGree, a third-year UB dental student, said the Amish children, many of whom have never seen a dentist, came to UB because it’s the closest dental school where they can find this kind of program. Give Kids a Smile Day is held as part of National Children’s Dental Health Month in collaboration with the American Dental Association and the 8 District Dental Society.